This rich, creamy goat cheese tart is topped with fresh blueberry and sweet corn salsa. Line a large baking sheet with a piece of parchment paper. Lay puff pastry sheet flat on the parchment paper-lined baking sheet. Using a fork, poke holes all over the puff pastry sheet, except for a 1" border around the edges. In a small bowl, whisk the egg white with a fork. Use a brush to lightly brush the whole puff pastry sheet with the egg white. In a medium mixing bowl, combine the cream cheese and goat cheese. Hint: Let them both soften at room temperature to make mixing easier. Add the thyme leaves to the goat cheese mixture. Add salt and pepper, to taste. Mix well. Spread the goat cheese filling in an even layer on top of the puff pastry sheet. Leave a 1" border around the edges. Bake the puff pastry for 20-25 minutes, checking often. The pastry is done when it turns a light golden brown. While the goat cheese tart is baking, make the blueberry salsa! Peel open the sweet corn, and carefully remove the corn kernels with a sharp knife. Discard the cobs and husks. In a medium mixing bowl, combine the sweet corn kernels, red bell pepper, ,jalapeno, and red onion. Cut the lime in half, and squeeze the fresh lime juice into the salsa mixture. Add salt and pepper, to taste. Stir to combine. When the goat cheese tart is done baking, remove from the oven and let it rest for 2-3 minutes. 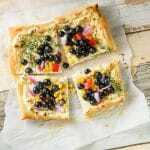 Top goat cheese tart with the blueberry-sweet corn salsa and serve!